My work in July has been more face-to-face than I have been used to in recent years. 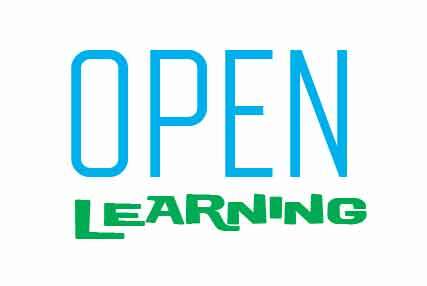 This has been a pleasure and illuminating in many respects, and has caused me to reflect once again on the meaning of ‘openness’ in teaching and learning. I have been supporting tutors in the development of modules for an online Masters programme to be delivered in Blackboard. In my last post, I wrote about some of my frustrations with Blackboard and this hasn’t changed, but I realize that a lot of my frustrations result from having worked outside an LMS for the past 10+ years, i.e. out in the open. I am now used to working in the open; as such Blackboard feels very ‘closed’. The tutors I am working with are, mostly, not used to working ‘in the open’, for example in Twitter or on personal blogs, such as this one. They are used to working within Blackboard, uploading resources and using some of the Blackboard tools, such as discussion forums and the Blackboard blogs. The problem with an LMS is that it’s easy for the tutor to be invisible and for modules to become repositories for resources. We have been discussing how to increase tutor ‘presence’ in Blackboard by creating and posting videos, engaging in discussion forums, blogging, and engaging synchronously with students. Research has shown (for many years) that tutor ‘presence’ promotes student engagement online. Increasing this presence can be made easier by using tools outside Blackboard, in spaces such as Google Hangout, appear.in, Skype, Twitter and on a personal blog. (Thanks to my colleague Mariana Funes for pointing me to appear.in. I think this will be a very helpful tool). But being ‘in the open’ raises security alarm bells for some tutors. What if their students post the less than perfect (in their eyes) videos they have made on Facebook? What if synchronous sessions with students, which are not intended to be viewed by anyone other than the student group involved, suddenly find their way onto the open web? What are the risks? Even creating ‘unlisted’ videos in YouTube is no guarantee that they won’t find their way on to the open web. A student might (with no intended malice) post the link in a public place. I can sympathise and empathise with these tutors’ concerns. I have been on the end of online ‘unpleasantness’ when in the open, so I know how it feels and I know the threats that this can pose to my reputation as a consultant, tutor, researcher and scholar. I know what an ‘ugly’ place the open web can be. I know the risks of openness. But I also know the values. I wouldn’t be where I am today, working with wonderful research collaborators, having access to a diverse range of people and online resources and constantly having access to stimulating learning opportunities, if I hadn’t been prepared to ‘put myself out there’, at least to some extent. If I Google myself I find a whole host of sites where I am referenced. I do have an online presence. Occasionally I find things that make me cringe and that I wish weren’t there in the open. For example, like many of the tutors I am working with, I don’t like seeing myself on video; I do not think this is a personal strength – but whilst I might cringe, I am not ashamed. I don’t think I have done, and I hope I never will do, anything of which I am personally ashamed on the level of professional or personal integrity. For me this is the bottom line. Of course we will all make mistakes when working online, just as we do face-to-face, but strangely being open online can serve to make us more responsible and accountable than we might be in other offline spaces. For example, years ago I used to regularly travel to another part of the country to run teacher in-service training sessions. I remember at the time finding this a relief. All my other work was teaching face-to-face in classrooms, where if I made a mistake one day, I had to face the same students the next day or week. For the in-service training in another part of the country, I knew I would never see those participants again, so I felt under less pressure, although of course I made the same efforts to avoid making mistakes as when working face-to-face. You would think that working online would offer a similar level of distance and obscurity, but if you come out of a closed space such as Blackboard, the opposite is the case. In working online in the open, we leave a record of our activity for all the world to see, should anyone be interested. The benefit of this is that we become acutely aware of our responsibilities and accountability to our students. In this sense, openness could be seen as positive professional development, despite the risks. 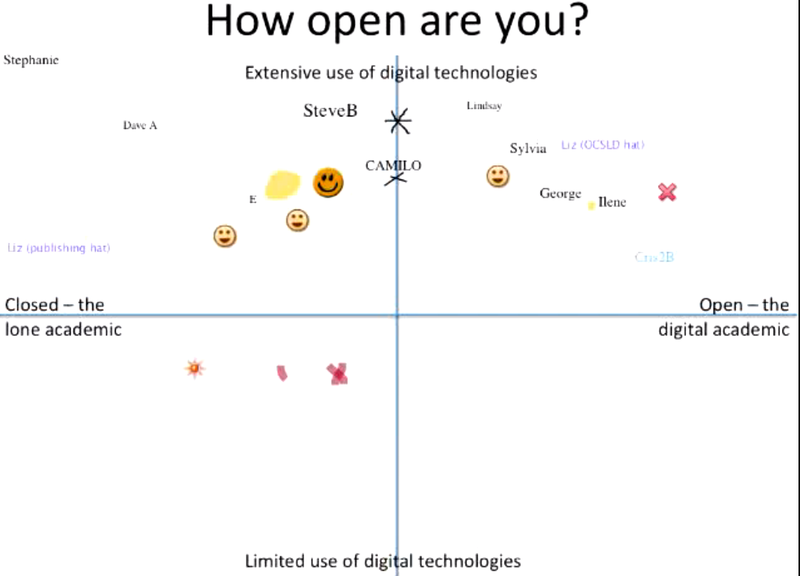 I have written lots of posts about openness in the past, exploring the advantages and disadvantages (see for example search results for ‘open learning’ , ‘how open are you?’ and ‘openness’). Overall, I would always recommend that a tutor gives it a go, even if only in a small way to begin with. What I haven’t quite sorted out in my own head is how we can ensure that students adopt the same levels of responsibility and accountability as their tutors, so that no-one needs to worry about what might be revealed in the open; that we have a shared understanding of what responsibility and accountability mean when working in the open. Someone who has been exploring these issues for years with her tutor team is Lisa Lane. Lisa voluntarily (i.e. beyond the remit of her job) runs an open Programme for Online Teaching and supports tutors in the development of their online teaching skills through the programme and sharing of an extensive bank of open resources. Last year Lisa also invited bloggers from her own institution and outside to contribute a post which reflected their interest in and understanding of online learning. Many different perspectives were shared and these have now been collated into a booklet which Lisa will share with her faculty. This seems like another great way to promote open teaching and learning. This is the last week of George Veletsianos’ open course – Networked Scholars. I have not been as engaged as I had hoped, mainly because my offline or backchannel/closed, more personal networks, have been more important to me over the past few weeks than interacting openly online. I have also been increasingly aware this year and particularly over the past few weeks of ‘the dark’ side of working openly online, to the extent that I am now reflecting on how much I want to work openly online. It did seem that the Networked Scholars course focused quite a bit on the negatives of working openly online. We started off positively with Michael Barbour sharing his practice on visibility, presence and branding in the first week, but in the second week the focus was on Challenges and Tensions, with some troubling case studies to consider, although the expert chat with Royce Kimmons was excellent. In week three the focus was on caring and vulnerability and Bonnie Stewart shared her perspectives in the Google Hangout session. 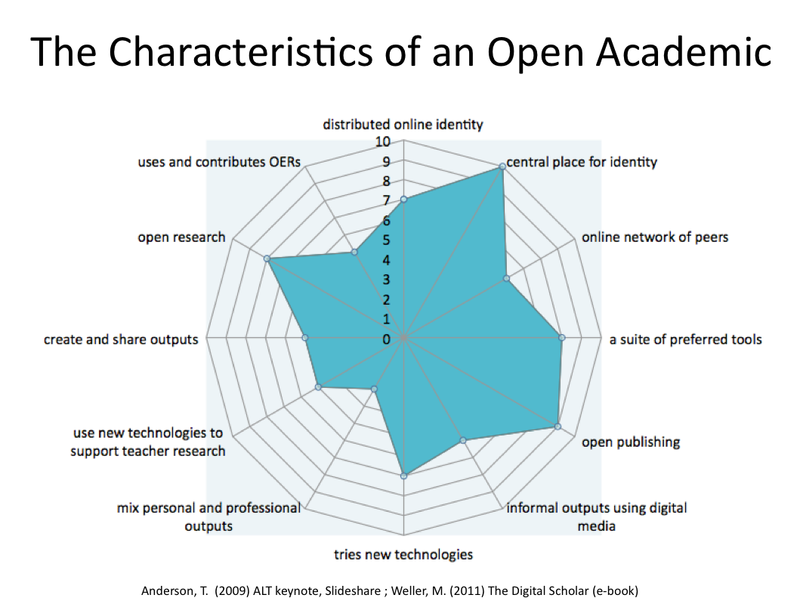 A need to consider vulnerability indicates the challenges that some academics may have working openly online. This week we have been asked to reflect on our experience and draw a concept map, but me and concept maps don’t go together, so I am going to tackle it from a more personal viewpoint. I can’t be objective because I haven’t read all the readings, or even followed all the discussion, but subjectively the course has compounded my feelings that there is a ‘dark side’ to all this online sharing and interaction, in the name of being a networked scholar, which currently I don’t feel comfortable with. Of course I know it is the accumulation of a whole range of life and work experiences and not down to the course itself. But this week I noticed this wonderful image on a Twitter post and felt compelled to follow it up. This was shown in lighting architect Rogier van der Heide’s Ted Talk about ‘Why light needs darkness’. There are a number of beautiful images in this talk, all of which illustrate how we can get a new perspective on the world by appreciating the role of darkness in revealing the light. So it occurred to me that perhaps the ‘dark side’ of the internet allows us to more clearly see the light and the light paths that we would like to follow. 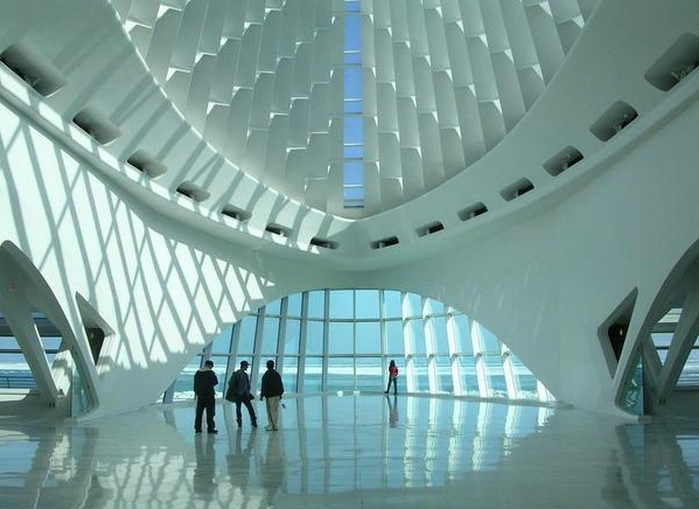 Both light and dark define the space. By the end of the course I hope that you will be better informed about the role of social media in the lives of knowledge workers and academics, be able to have an informed conversation about this topic with your colleagues, and decide whether and to what extent you personally might use social media for academic purposes. I think I could answer ‘Yes’ to all three points, but mostly I think I am clearer about what I am not prepared to do in the name of open networked scholarship; I am clearer about the light and dark spaces.